There was an hour of terrible darkness at the beginning of his Passion, when Christ was overwhelmed by the anticipation of the suffering he was to go through, when the vision of the evil for which he was to bear the shame overwhelmed him, and the utter loneliness in which he must face and accept the anguish of spirit that seemed to be beyond human endurance crushed him to the ground. Those whom he loved, for whom he was going to accept this dreadful suffering and death, could not stay awake to share his anguish with him, to give him even the support of their sympathy. Three times on the way to Calvary his body failed him. 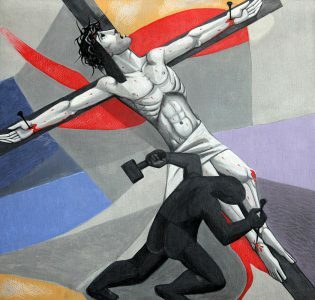 Even that tremendous will of love which enabled him to accept the Passion after his prayer in Gethsemani could not wholly overcome the weakness of his human body struggling on under the cross. He had to be lifted to his feet, he had to be helped by a stranger. But now (though many generations will pass before men see this clearly), now that the Passion is coming to its climax, Jesus is no longer afraid, he no longer asks to be spared; on the contrary, by his own will he is crucified, by his own will he is nailed to the cross, fastened to it in such a way that he cannot come down, cannot fall from the cross. He who is God is also man, perfectly man. He will not allow any miracle to help him now. He who is going to indwell every man who loves him – be he sinner or saint – through all the generations to come accept the limitations of their human nature as his own, and so that he may not fall from the cross, by his own will he lets himself be fastened to it. His human mind is tranquil now, no fear overwhelms him; his suffering, his dying, is made acceptable to him by love. He is thinking now of other men, of those who are crucifying him, and he is thinking of them, praying for them, in words that everyone can hear clearly, words of unimaginable love and pity: “And when they reached the place which is named after a skull, they crucified him there: and also the two criminals, one on his right and the other on his left. Jesus meanwhile was saying, ‘Father, forgive them; they do not know what it is they are doing,’” (Luke 23:33-34). To those who stood around, the majesty of Christ’s prayer and of his acceptance of the crucifixion was not obvious. It was something wholly outside their comprehension. This incredible triumph of his love seemed to them to be simply the endorsement of his failure. They could not believe that if he really had supernatural power he would let things come to this; that if he was really king of the Jews and had come to save them and establish his own kingdom he could allow himself to be actually fastened onto the cross to die. This was not conquering the world; this, at best and worst, was forsaking the world, escaping from the world, giving up the fight! But still, even now, there is the possibility that he may save himself – and them – by a miracle, a miracle that will stagger their enemies and conquer the world for himself, and for them. “The people stood by, watching; and the rulers joined them in pouring scorn on him: ‘He saved others,’ they said; ‘if he is the Christ, God’s chosen, let him save himself.’ The soldiers, too, mocked him, when they came and offered him vinegar, by saying, ‘If thou art the king of the Jews, save thyself,’” (Luke 23:35-37). To those who stood by it must indeed have seemed now that Christ was separated from other men. He had been led out, outside the city wall, to die; he was rejected by his own chosen people; he was powerless in the hands of those who must crucify him (almost without interest), in the course of their ordinary duty. He was an object of mockery and scorn; he seemed to be a fool, and as a fool his enemies treated him – as a fool, or perhaps a madman, they thought of him now. Even those who loved him were abashed and silent. His mother alone was silent because she entered perfectly into his suffering with him. There was no need for any words between Jesus and Mary: his passion was hers, her silence his. But others were silent with dismay, with fear, even with doubt and disillusionment. The thing was beyond words now: a word of loyalty to Christ, a word of pity, would have been enough to endanger a man’s life; at the very least, it would have made a fool of him too. That was how things seemed to be. But in reality, as Christ stretched out his beautiful craftsman’s hands and composed his blameless feet on the hard wood of the cross to receive the nails, he was reaching out to countless men through all time: as he stretched his body on that great tree that was to flower with his life forever, he gave himself to be made one with all those who in every generation to come would willingly bind and fasten themselves irrevocably to the cross, for the love of God and the love of men. For all through time for those who love Christ and who want to be one with him, love and the cross would be inseparable; but because Christ willed that he should be nailed to the cross himself in his human nature, love will always predominate and redeem the suffering of the cross. As the three nails were driven home into the wood, fastening him to it irrevocably, Christ gave himself to all those men and women who in the years to come would nail themselves to his cross by the three vows of religion – poverty, chastity, and obedience; those wise ones who know the weakness of human nature, who know how easily the will can falter when the sweetness of the first consolation of prayer is over; how hard and bleak the winter of the spirit when its springtide and its summer and harvesting seem passed forever; how hard to go on faithfully clinging to the Christ life with only one’s own weak will to drive one. Christ, receiving the nails, gave himself to those men and women who would nail themselves by binding vows to himself upon the cross, who would have the ability to remain true to their chosen life because their hands and feet are put into his hands and feet, and they are held onto the cross by the nails that held him. He gave himself in that moment to all those men and women who would pledge themselves to him and to one another with the vows in matrimony, the three blessed nails of human love safeguarding husbands and wives from the assaults of temptation in every circumstance of the world, the vows to love, honor, and obey. He gave himself to all those converts who bind themselves to the laws of the church and all those Christians who persevere in the faith, nailed to it by their own baptismal vows, no matter what hardships it may involve them in; nailed to it willingly because they know well that without Christ they can do nothing, and that Christ in this world is inseparable from his cross. And with what great tenderness, with what depths of understanding, Christ gave himself in that hour on Calvary to all those whom he would indwell – Religious, married people, ordinary Christians, trying to adhere to him, not through emotion, not through sentimentality, but by uniting their wills to his, and binding themselves irrevocably to him. With what love he gave himself to them, knowing how they too would be considered to be fools, would be mocked, and even looked upon with distrust and anxiety by their own people – by those who loved them. And this, despite the fact that in many countries of the world today, to openly vow yourself to religion is to put your head into the noose, to invite persecution! Not only would the Religious be thought to be fools, but those married men and women who were faithful and compelled themselves to be faithful to their three vows – whose love and whose fidelity to love is not that which the world of today can understand. to bow to the will of God. to the law of your love.